I'm joining in on the first Barnyard Bash over at Happier Than A Pig In Mud. I've gathered together all the critters from my "barnyard" that have appeared on various posts. them by clicking on the link/image. How fun is this ??? Thanks so much for coming by for this very first Barnyard Bash! My goodness what a beautiful collection! Ok, you win the award....this is ingenious!!! I love this so much I have bookmarked it so I can return and visit everyone individually. I can take a day and go farm touring! What a wonderful barnyard, Candy! I love how you've designed the pens! Hi Farmerette Candy! I believe you must have the most variety of animals on your farm!! Love it. Wow! Super impressed! Love your post. This is my first visit to your blogl...love it! Wow I like how you created picture links. Thank you all for coming by for the Barnyard Bash! I figured if I didn't separate all the critters there would be a knock down drag out fight or two or three! This way everyone seems to have behaved themselves, although the turkeys have been accused of making a mess in the chicken yard!! Turkeys do that you know. Oh Candy...I love this post! Cant' wait to get to all the stalls and corrals to see this menagerie. Ohhh my...your wooden wagon is awesome! It looks like it came from Europe? Love it!!! Wow...you really have had some cool creatures visit your fabulous tablescapes! I love that Irish ram!!! Thanks for sharing all of your pretties with us today for the Barnyard Bash! Hi candy, your barnyard is full. I love all of your fun and beautiful entries. The carriage is awesome and a wonderful treasure. Thanks for stopping by to see the critters! 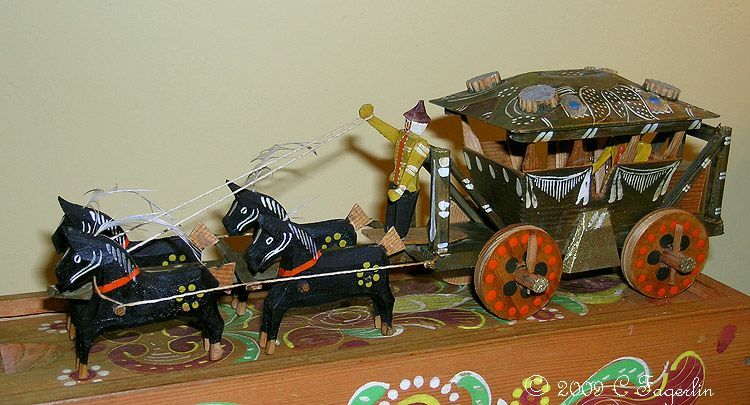 The wooden carriage is German, circa 1950 and is from my childhood.